Boston.com / News / Boston Globe / Ideas / The evangelical pope? No one would mistake John Paul II for an evangelical Protestant. But he contributed to a dramatic warming of relations between evangelicals and Catholics that may mark a turning point not only in American politics but in the history of Christianity. DURING THE 1960 presidential campaign, leaders of the National Association of Evangelicals - including Harold John Ockenga of Boston's historic Park Street Church - joined other Protestants in warning the nation about the danger of electing a Catholic, John F. Kennedy. Last year, the conservative evangelical spokesman Gary L. Bauer saw the matter very differently. The deep suspicion that in 1960 characterized evangelical attitudes toward Catholics - and Catholic attitudes toward evangelicals - has moderated considerably. What has changed? Why have the changes taken place? And how did Pope John Paul II contribute to those changes over the past quarter-century? MESSAGE BOARD: Are relations between Catholics and Protestants at a historic turning point? The most obvious indication of change is political. Catholics who attend church regularly and who embrace traditional moral stances on abortion, gay marriage, and other issues, voted almost as strongly for the Bush-Cheney ticket as churchgoing white evangelical Protestants who embraced the same traditional positions. What Timothy George, founding dean of the Beeson Divinity School in Birmingham, Ala., once called an ''ecumenism of the trenches'' - that is, an ecumenism forged in political action - has forever altered evangelical-Catholic relations in the United States. Catholics and evangelicals who advocate conservative convictions on chastity, family, and community have found each other as co-belligerents, and this co-belligerency has eased much of the hostility that once separated the two movements. 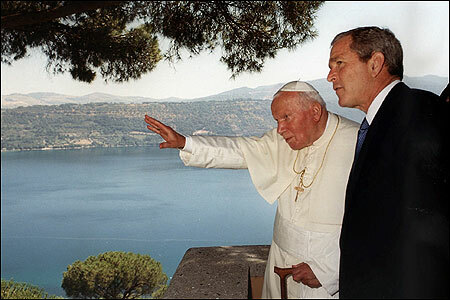 President Bush, himself a born-again Christian, has worked hard at nurturing cooperation with conservative Catholic leadership. But politics is only part of the story. Alterations in a range of religious beliefs and practices are running just as deepor even deeper. Only a generation ago, evangelicals almost universally condemned Roman Catholicism as a badly flawed, or even false, form of Christianity. The Catholic Church, it was said, kept ordinary people from reading the Bible; it took glory from Christ by obsessing over the person of Mary; it taught that people earned salvation by doing good deeds. Catholics fired right back to claim that Protestants abandoned tradition, the weight of history, and the seven sacraments in order to pursue an unruly smorgasbord of chaotically individualized religion. Such charges can still be heard. But over the past few decades the once isolated worlds of Catholic and evangelical Christianity have experienced unprecedented interchange, overlap, and cross-fertilization. At several of the World Youth Days convened in recent years by Pope John Paul II the ''Jesus Film'' - a dramatization of the Gospel of Matthew produced and distributed by Campus Crusade for Christ, one of the strongest evangelical youth ministries - was shown to all in attendance. In 2003 John Paul II hosted an official reception at the Vatican for leaders of the Alpha Course, the video series created by Anglican evangelicals in Britain that is today the most widely distributed introduction to basic Christianity in the world. The purpose of the Vatican meeting was for the pope to commend the Alpha leaders and for Vatican personnel to coordinate their own use of Alpha materials for Catholics. Hymns, songs, and Christian music of all sorts have built a bridge for spiritual traffic between the two groups. Evangelicals buy the CDs and attend the performances of Catholic troubadours like John Michael Talbot. In turn, evangelical praise songs and hymns are being sung in all manner of Catholic churches and campus groups. Multiple forces lie behind these developments, the most important being the ongoing effect of the Second Vatican Council, the great conclave of all Catholic bishops convened by Pope John XXIII shortly before his death in 1963. After the Council was over, the evangelical theologian David Wells, who now teaches at Gordon-Conwell Theological Seminary in Massachusetts, concluded that the Council's actions had ''rendered the vast majority of Protestant analysis of Catholic doctrine obsolete.'' Wells correctly predicted that the Council would push change among Catholics in many different directions, with some moving toward social radicalism and theological liberalism and some moving closer to evangelical theology and practices. As a result of the Second Vatican Council, Catholics sought ecumenical dialogue with many other Christian bodies, including evangelicals. The Council's stress on encouraging the laity and on opening the Scriptures to the whole church also led to new points of contact with evangelicals. These developments are not leading to a formal union of churches. But they have led to much better communication and a general relaxation of mutual suspicion. Changes in Christianity around the world have also helped bridge the gap between Catholics and evangelicals. To be sure, in some parts of Latin America and a few other places where historic Catholic churches would like to retain total control over society, relations between the two communities remain nearly as tense as ever. But more typical in the developing world are situations of rapid Christian advance where evangelicals and Catholics labor in parallel to provide Christian teaching and assistance for spiritually and physically needy people. A recent pamphlet by Chika-Odinaka, a Nigerian who is a member of the Dominican religious order, is entitled ''Catholic and Born Again.'' It is but one example of the kind of Catholic borrowing from evangelical emphases that is taking place in many parts of the southern hemisphere. Domestically, a strategic initiative called Evangelicals and Catholics Together (ECT) has both measured and promoted closer contact between representatives of the two Christian movements. Leaders of ECT include the Catholic priest Richard John Neuhaus, editor of the journal First Things; the evangelical author and broadcaster Chuck Colson, who heads a large ministry to prisoners; and distinguished theologians like Avery Cardinal Dulles from the Catholic side and J.I. Packer of Regent College, Vancouver, from the Protestant side. From its first joint statement, ''The Christian Mission in the Third Millennium'' (1994), to its most recent, ''The Call to Holiness'' (released in early 2005), participants in ECT have pushed their fellow-religionists to acknowledge broad commonalities of Christian doctrine, spiritual life, and ethical practice. They have also helpfully spotlighted important differenceslike the authority of the pope or the place of Mary in the drama of salvationthat remain to divide the two movements. It has been reported that John Paul II was kept abreast of the ECT discussions, and that he approved. Even firmer evidence points to the pope's role as the world's most visible public Christian in making a difference for evangelical attitudes toward Catholics. Until well after World War II, evangelicals typically suspected Catholics of a certain lack of commitment to American national ideals. After all, as those Protestant leaders feared in 1960, were not Catholics bound to obey the instructions of a foreign leader (the pope), if push ever came to shove? Evangelicals who paid any attention to John Paul II's speeches, travels, writings, and general positions were forever disabused of such notions. His general leadership in promoting the free exercise of religion, his key role in the Solidarity movement in Poland, his temperate statements on explosive political situations in Latin America, Africa, and Asia (including his efforts to minimize strife between Pentecostals and Catholics), his mediation as peacemaker in Northern Ireland, the Middle East, and elsewhereall of these actions undercut whatever civic anxiety American Protestants had maintained about the Catholic church. Still, several qualifications are necessary in thinking about John Paul II and Protestant evangelicals. His own primary interests in inter-religious dialogue were aimed not at evangelicals, but at bringing the Roman Catholic and Eastern Orthodox churches together, and then in repairing Catholic relations with Jews and Muslims. It was also obvious that, although the pope was a person of evident piety who treasured classical Christian teaching, he could not command the many Catholics who did not share his traditional convictions. In addition, the pope's great stress on Mary as protector of Poland and patron of the Catholic church hardly sat well with evangelicals. Nevertheless, while no one would mistake John Paul II for an evangelical, he was responsible for a great deal of the normalization of relations that has occurred between the two Christian communities. Evangelicals greatly respected his resistance to Communist tyranny and his efforts on behalf of a ''culture of life.'' They could appreciate the Christ-centered elements of his personal piety, as illustrated by words he prepared for a homily the first Sunday after Easter: ''Lord, who with your death and Resurrection revealed the love of the Father, we believe in you and with faith we repeat to you today: Jesus, I trust in you, have pity on us and on the entire world.''' Evangelicals who have taken time to read the ''Catholic Catechism,'' which the pope shepherded into print, have found a bracing statement of orthodox Christian faith, though of course in a distinctly Catholic dress. Those who have read even some of the pope's many encyclicals recognized one of the 20th century's most astute Christian intellects at work. With all qualifications noted and all the important points that still divide evangelicals and Catholics fully in view, it is still fair to say that this pope deserves a great deal of credit for opening doors between Catholics and evangelicals that had been mostly closed since the Reformation of the 16th century. To see evangelicals and Catholics making common cause politically represents dramatic change. To see these former antagonists talking to each other once again about prayer, the Bible, and the person of Jesus Christ is of much greater importance for the whole history of Christianity. Mark Noll, a historian at Wheaton College in Illinois, is the author of ''America's God'' (Oxford) and co-author of the forthcoming ''Is the Reformation Over? An Evangelical Assessment of Contemporary Roman Catholicism'' (Baker Books).